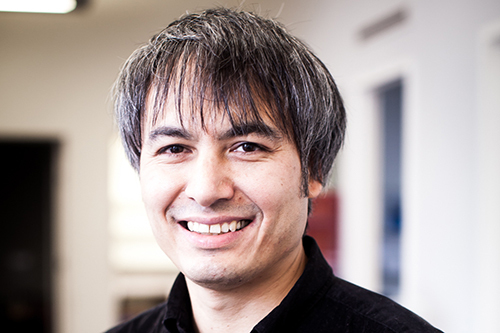 "What I want to do is to connect all our senses to the internet," says Professor Adrian Cheok, Professor of Pervasive Computing at City University London. "Today you can post a picture on Facebook and describe what you are up to but what does it smell like to be at that amazing beach or how does dinner taste at that Michelin star restaurant?" he asks. "I want us to move from the information age, where we are communicating logical data across the internet to the experience age where we communicate sensual data such as touch, smell and taste," he explains. Adrian is currently working on a device which digitally creates a sense of taste by actuating the tongue through electrical and thermal stimulation. That device is then connected to the internet wirelessly. He has also been working with neuroscientists in France to measure people's brain activity when they experience sweet, sour, salty, and bitter tastes and is trying to reproduce this activity with electrical tastes. "It's very early days for this invention but the potential is very exciting," says Adrian, "In the future I envisage kids creating entirely new digital tastes and smells via their computer," he adds. Another of the research projects Adrian is working on is a collaboration with Chef Andoni Luis Adruiz - regarded as one of the world's best chefs. Chef Andoni is famous for serving creative and unusual dishes, following the principles of molecular gastronomy, at his Michelin star restaurant Mugaritz in Spain. The aim of the project is to bring the experience of eating there to the wider public. Adrian is creating a mobile phone app which will transmit the unique smells of the dishes created in the kitchen and the app was launched in early 2014 at one of the world's largest gastronomy conferences in Madrid. Adrian is also working on a couple of inventions which recreate human touch. "Psychologists have found that more than half of all human communication takes place nonverbally but in today's busy society we aren't always with each other so I wanted to find a way to re-establish human touch remotely," he says. The first of the products Adrian has conceived is a pair of pyjamas which are targeted at parents who work or live away from home. The pyjamas are connected by a wireless app to the internet, and allow parents to show their child affection even when they aren't physically there by transmitting a realistic hug sensation to their child via the pyjama suit. Building on the same idea Adrian has also created a ring (known as RingU), which you can give to your partner, child or friend and use the internet to transmit a 'finger squeeze' in real-time to let them know you are thinking of them. Adrian says that initially the products he is creating will be used primarily for leisure and entertainment but he believes being able to communicate sensual data will have a dramatic impact on every facet of society. "Having the capability to communicate with all our senses will inspire new businesses, children in school will be able to learn about things through smelling and tasting as well as watching videos and reading books and even healthcare could benefit." Adrian, who was born in Adelaide, Australia, was first introduced to the limitless possibilities of technology when he was taken by his aunt to see the original Star Wars film when he was 6. "The scene that stuck with me was when R2D2 and Chewbacca were playing 3d hologram chess on the Millennium Falcon," he remembers. Twenty years later after doing a Bachelor of Engineering at the University of Adelaide he began to work on creating a 3d hologram display when he started his academic career as a young Assistant Professor at the National University of Singapore. "It was like a dream come true for me working on something I'd been obsessed with as a kid," he says. While he was working on this project Adrian realised that communicating a 'visual presence' was only a starting point and he started thinking about what he could do to communicate presence in a more realistic way. This drew him into his current research field which blurs the lines between the human senses and computers. After working as a Full Professor at the Graduate School of Media Design at Keio University, and Associate Professor at the National University of Singapore Adrian came to City in 2013. He is really excited about the University's connections to Tech City and is already doing a lot of work at the Hangout (an incubation space near the Old Street Roundabout). "I've been working on some amazing research projects such as RingU and the Huggy Pyjama and I'm keen to take these inventions out of the lab and turn them into real ventures - being at City opens up a lot of doors to me and I feel very inspired being in London," he says.